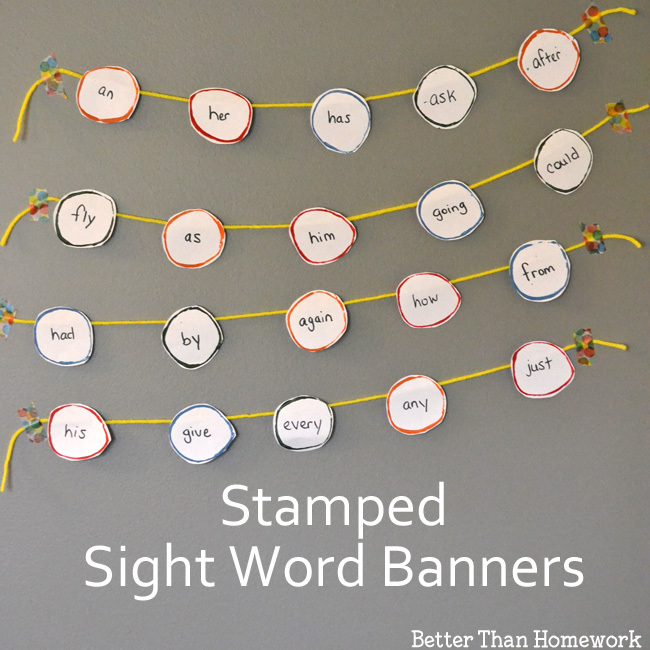 There are so many fun ways to practice sight words, which is great because they are a super-important part of learning to read. With this project, we’re going to make a fun craft project with our sight words, Stamped Sight Word Banners, and use it all year long to support learning. You’ll first want to prepare your paint. Pour or squeeze out a bit on a flat surface. I like to use a clean plastic lid from an old food container (like a sour cream container). Spread it enough for your cardboard tube. 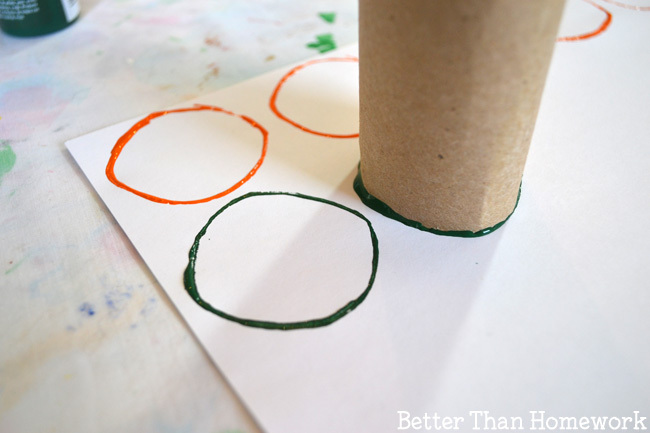 Next, take your cardboard tube, place it in the paint and then use it to stamp circles on your white paper. 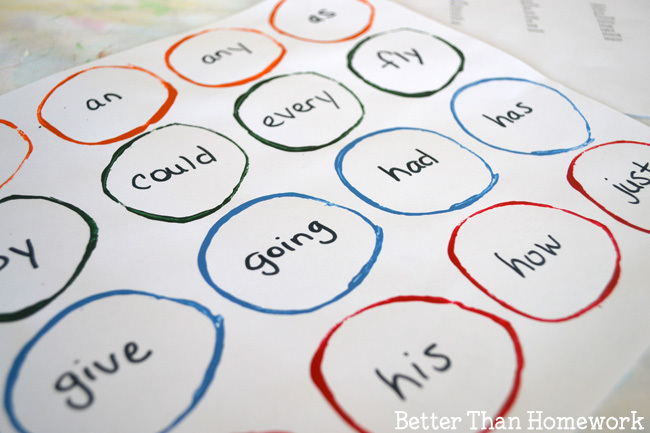 Stamp enough circles so that you have one for each sight word. You can use all one color or multiple colors. But, you will want to use a clean end of a cardboard tube for each color. Let the paint dry and then write each sight word in a circle. Use the sight words from a list sent home from school, or find a online resource to find the sight words for your child’s grade level. You can also use the Dolch sight words from our Flower Sight Word Cards. Next, cut out each of the circles. 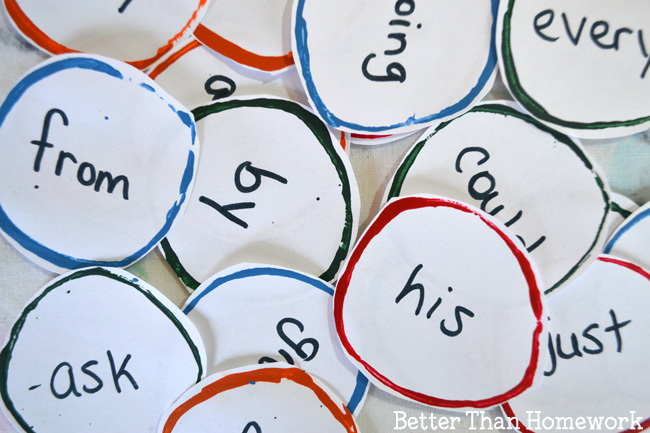 These fun stamped sight word circles would be fun to play and learn with on their own, but we’re going to go one step further and turn them into banners. Decide what order you want your sight words. You can put them in alphabetical order or a random order. Take a length of yarn and tape each circle a standard length apart. If you tape the yarn near the top of your circle, it won’t flip over as often. 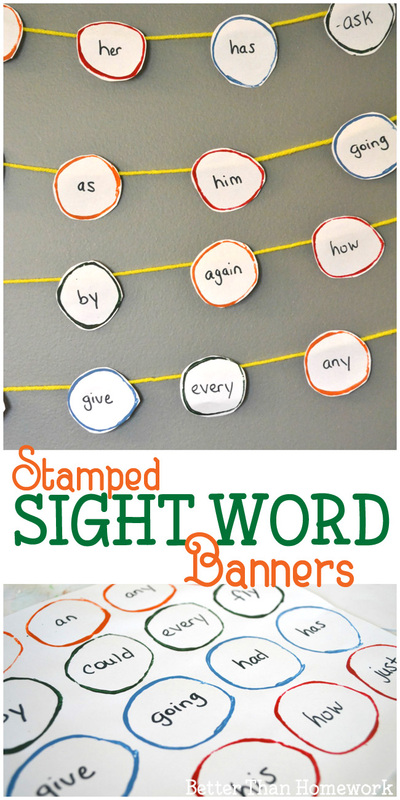 Make several sight word banners or one long sight word banner, depending on where you would like to display it. Finally, hang your sight word banner on the wall. How can you use your Sight Word Banner? 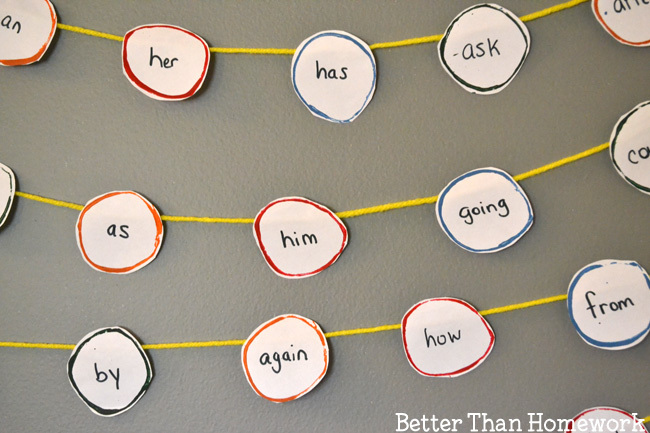 This sight word banner make a fun display in a homeschool room, at your homework station, or in the classroom, but you can also have a bit of fun with it as well. Keep it off the wall and use it to read sight words every day. Instead of reading flashcards or a list, you can read a fun chain of words. Put all the circles in a bag, reach in and pull one out. Read that word and then choose another circle. Or, you can use the circles to play a game like our -AT Hat Word Family Game. Use the banner as a word prompt when playing a fun game like Sight Word Tallies from Creative Family Fun. Can you find each of the words in a book you’re reading? How would you use this Stamped Sight Word Banner? If you enjoyed this post, the above photo is perfect for sharing on Facebook or you save the photo below on Pinterest.